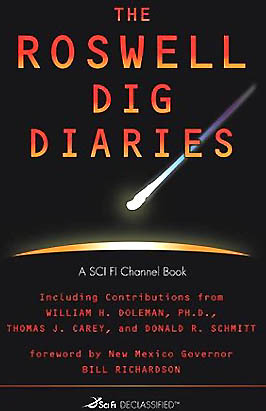 August 18, 2004 Santa Fe, New Mexico – A paperback book entitled The Roswell Dig Diaries has been published by Simon & Schuster’s Pocket Books in collaboration with cable’s SciFi Channel. The subject is the controversial crash of one or more unidentified flying objects in the desert north of Roswell. The word “dig” refers to archaeological efforts in the past few years at the alleged crash site which have been reported in documentaries broadcast on the SciFi Channel. Dozens of books have been written about eyewitness accounts and testimonies of military people and others allegedly involved in the recovery of debris – and perhaps non-human bodies – from the Mac Brazel ranch between Corona and Roswell in early July 1947. Other information from Bob and Ryan Wood’s Majestic-12 Documents website, indicates there were other crashes and U. S. government retrievals at the White Sands Missile Range and beyond. The new book’s foreword was written by New Mexico Governor, Bill Richardson, who served as Secretary of Energy under President Bill Clinton. In his foreword, Governor Richardson wrote, “…the mystery surrounding this crash has never been adequately explained — not by independent investigators, and not by the U.S. government. … There are as many theories as there are official explanations. 03/17/2004 — Part 2 – “Horrible Secret” in UFO Crash Retrievals Near Roswell, New Mexico, in July 1947? 03/17/2004 — Part 1 – “Horrible Secret” in UFO Crash Retrievals Near Roswell, New Mexico, in July 1947? Next PostNext What’s Happening to U.S. Constitution’s First Amendment?